In the first installment of a two part interview, Hackie Reitman, M.D. speaks with Bankole A. Johnson, DSc, MD, MBChB, MPhil, FRCPsych, DFAPA, Dip-ABAM, Dip-ABDA, FACFEI, who heads the Brain Science Research Consortium Unit (BSRCU) at the University of Maryland School of Medicine, and is one of the world’s leading authorities on the subject of addiction. He is a leading neuroscientist and a pioneer in the development of medications for the treatment of alcohol abuse, and was featured on the HBO documentary series, “Addiction.” Professor Johnson discusses the ties between addiction and neurodiversity, how discoveries in neuroscience may change the way substance abuse is treated, and the importance of understanding the relationship between the body and the brain. For BSRCU’s newsletters, click here. HAROLD REITMAN, M.D. 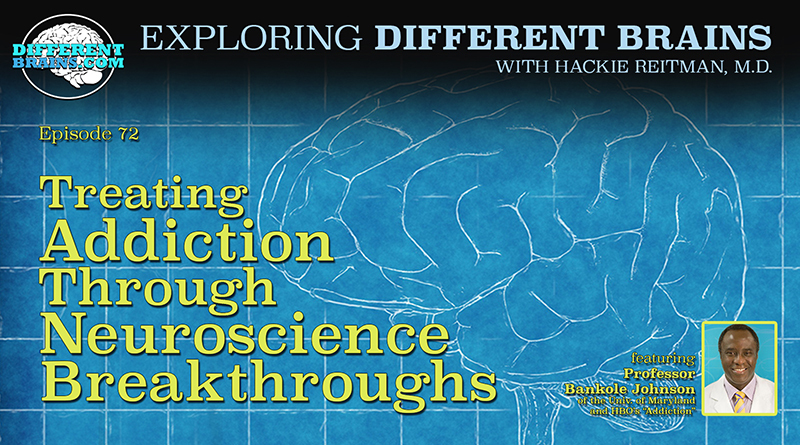 (HR): Hi I’m Doctor Hackie Reitman, welcome to another episode of Exploring Different Brains, we’ve got a super all star today Dr. Bankole Johnson from the University of Maryland one of the worlds fore most authorities on addiction and so much else about the brain. In fact he is part of the whole brain institute down there and he’s going to tell you about at the University of Maryland. Bankole welcome. PROFESSOR BANKOLE JOHNSON (BJ): Welcome and thanks for having me on your show. HR: Well thanks a lot. Why don’t you introduce yourself to our Different Brains audience Bankole. BJ: Well my name is professor Bankole Johnson and I’m the chairman of the department of Psychiatry at the University of Maryland. Most the chairman in a few other departments like neurology and pharmacology, most importantly I help coordinate and direct the activity of the brain consortium unit, Which brings all we know about brain science to a collective table to provide ourselves with the opportunity to develop these moon shot object that I’m going to hopefully radicalize treatments and the way we manage people with brain disorders. HR: You know that is such music to my ears because here are Different Brains we’re trying to get it all under one roof and everyone except for you is in all these different silos where you have mental health issues over here and developmental here and neurological issues here and it’s all the same stuff. Wouldn’t you agree with that? BJ: It is all the same stuff and I can give you a perfectly good analogy if you’d like to hear one. HR: I would love it. BJ: Lets say you were walking down the streets of else where and unfortunately for you somebody punched you in the head. Now you might well say when you got punched in the head and you later became depressed because somebody punched me in the head obviously it upset me because I wasn’t very happy about it and I wasn’t happy that I got punched in the first place. But here is the other piece of it. Could it be that when you got punched in the face that caused a swelling in your brain, that swelling in your brain changed specific structures in your brain and it made you depressed and it had nothing to do with your psychological reaction to it which could have been a part but the primary issue is because you got punched in the head. Now also when you get punched in the head as you know, you have traumatic brain injury so you also have traumatic brain injury also seeded with it. So the neurological is associated with the psychological and is also associated with the behavioral and it’s all in one brain. HR: Brilliantly put, brilliantly put and I will not take offence that you were describing some of my 26 pro heavy weight fights where I took a good beating Bankole. BJ: I think you won some too. HR: It keeps you humble. Now Bankole you have no idea, this is such music to my ears it’s like a kindred spirit where you get it. Now why is it? and I’ll quote here Steve Ronik, he happens to be the head of Henderson Behavioral Systems down here at Behavioral Health Henderson down here in Florida they have 800 employees, they serve 30,000 patients a year, he said hackie why is it when you go to a cardiologist or an oncologist there is no stigma but if you go to a mental health professional there is a stigma attached and we get better results. We get better results and what you’re doing there, it sounds like it may help get rid of the whole stigma to all of this. BJ: I couldn’t agree with you more and I think it dates back to a few hundred years where people tried to separate the mind from the body as if it were two components of a system that never really talked about another and at least my angle is going to be some higher order type of cognitive thinking and the body was meant to be basically the mechanics and they were not connected so if you’re going to see someone if you have mental health issue people believe that it must be due to this nebulas concept of a mind and that its some how your responsibility or at least partially your responsibility and it has nothing to do with your body. Well we know now that this is completely incorrect. The brain is the most complex organ in the universe, it has connections with you heart, it has connections with basically everything else and to give your friend the heart analogy we now know that individuals who have heart disease often also have mental manifestations of that heart disease and brain stress or distress in the brain is also associated with cardiac arrest and cardiovascular disease. It’s one system. I think some people like to make it simple, but as my professor used to say it can only be as simple as it really is. HR: That’s a naturally segway into the gut brain where the gut has more neurons than the brain I think and can really affect the neuroplasticity. BJ: You know that has been a fascinating journey and I would say if you went back 30 years ago and you had talked to people and said well what’s in your gut can influence what’s in your brain, well that doesn’t really make sense because the gut has no direct connections with the brain except for some of its large nerves. 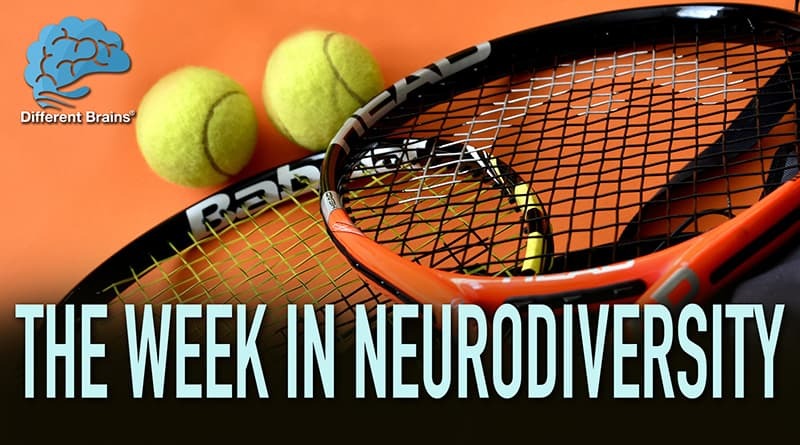 The real issue here is we now know that these neurotransmitters in the brain or these micro bio can provide signals in the brain and certain parts of it. These signals are very important. So maybe we’re going to go back to believing what we did thousands of years ago, I want people to say well it’s my gut feeling. Well maybe it might be the best feeling you actually have. Maybe its good thinking about and one of the fascinating parts of all of this development so I can bring back to neuroscience is that it could be possible in the future for us to be able to understand how these gut organisms provide signaling in the brain and therefore changing aspects of the gut, either through diet or medicines or drugs, that we will be able to influence the affects of the brain with out having to actually having to get into the brain itself. That would be fascinating. It opens up a whole area of even trying to create vaccines in the gut that influence brain inflammation processing and signaling, it’s unbelievably exciting. HR: Well this is a segway into, lets call them lack of a better term, the traditional approaches to alcohol addiction and the Dr. Bankole Johnson approach. BJ: Well I hope you don’t call it just the Dr. Bankole Johnson approach, I hope you call it the evidence-based approach because I hope it’s evidenced based. There are several myths about alcohol and I usually write about 100 of them when I teach my students, but one of the most important things is to realize that alcohol abuse disorder and alcohol dependencies are actually far more biological disorder, about 60% of what makes you become and alcohol is inherited. Therefore, that doesn’t mean everybody who had an alcoholic parent becomes an alcoholic, but it does mean there is a huge susceptibility factor. The other thing that is important to know is that if you have a biological disease that is altering your genes, altering the way you think, well maybe it’s a good idea to have medicine as well, that also works with some of the psychological components to be able to help treat the disease. Another thing I will say is psychological treatments are great, they work, very effective, but medicines work really well as well. and you have to have both. You can’t just simply have psychological treatments. That’s like as you would say fighting in the ring with one hand tied behind your back. Or having one hand by your hip. It’s not really effective treatment, the most effective treatment combines medicine and psychological treatment. HR: That’s very well said and I often tell people don’t buy societies big lie that things are mutually exclusive, you don’t just have to do this or that, combine and take the best of all worlds. I was delighted by the way, my daughter Rebecca, who is kind of my hero who is now half way through her Masters in applied psychology, the text book she is using right now is biopsychology where they get into the actual anatomy and physiology explaining different behaviors which may be I don’t know, maybe 10 , 20 years ago you never would have found that in a psychology class at all. BJ: Well congratulations to her and congratulations to the course. I think that one of the sad problems that we have is what is currently known is to people who are informed in the field. It can take 10 to 15 years before the average family practitioner or average practitioner gets hold of this information and there fore some people do not get the best treatment. Not because they’re not going to see their doctor but because their doctors are not well informed. This goes to a whole aspect of training. I want to touch on something really very quickly if I may. BJ: It is absolutely important if you have an alcohol problem or a substance abuse problem to go and see your doctor because we know full well have not usually seen their doctor for a tremendous amount of time and they usually have a multitude of physical problems, blood pressure, diabetes, heart disease, and it’s really one stop. You go to your doctor to look after your whole health whether it’s alcohol, your heart disease, your blood pressure, your diabetes, and the doctor is not meant to compartmentalize one and ignore all the other aspects of your diseases. HR: It’s very well said, and I’m learning of all these new entities and work from Different Brains and all our bloggers and just people I’m meeting from all over the world, I just learned about something I was completely ignorant of, misphonia, where I’ve never even heard of it. Jennifer Jo Brout was explaining it to me because she suffers from it and I started reading about it. These are people who are not just as you know sensitive to sound but certain sounds like chewing or breathing drive them into a rage. Now you can see on the scans that part of the brain and I guess it’s probably near the amygdala light up where it’s not just the hypersensitivity it’s emotion, it’s violence, and they’re ready to go. 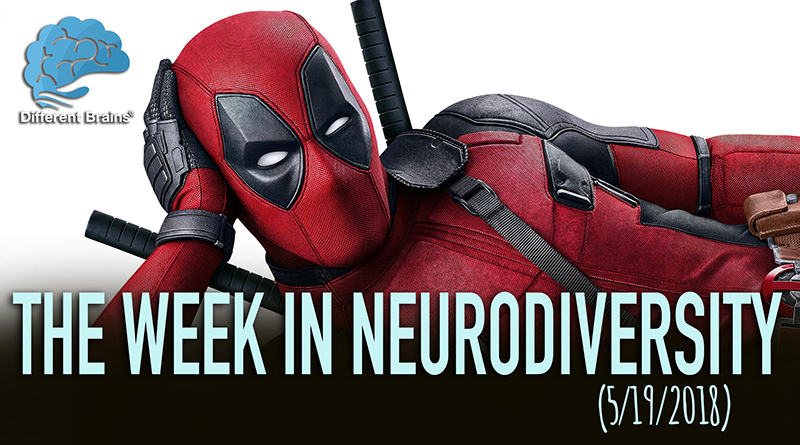 BJ: Well you know one of the interesting things that we’ve learned in neurodiversity is and here is another myth that has come that I would love to dispel for you. That everybody’s brain is the same, everybody’s brain is not the same, it’s not even close. In fact part of the problem, we all process information slightly differently, we may all depending on our genetic makeup, develop signaling pathways and response to different types of sensations and there for everybody’s brain is not the same. That’s why the path for meds in the future is this aspect of personalized medicine because we finally realize that you can’t treat everyone the same and expect to get the same result and that treatments need to be individualized and we have very powerful tools at the present time for individualizing medical practice. The question is how long is it going to take us to educate all doctors to be able to do this. HR: Well a segway into artificial intelligence, but that’s a story for another date, I suppose my daughter when she became one of nine women that year to get her discrete mathematics degree from Georgia Tech she then wanted to tutor people like she always has one on one and I said Rebecca why don’t you want to teach in a classroom why do you want to tutor and that led to the quote she told me on the cover of my Aspertools book which is “every brain is like a snowflake, no two are alike “and she gets that and I get that and some of the great scientists of the world being led by you are starting to get that, everything makes more sense. Now the University of Maryland where you are, thanks to you in no small part, you’ve created a vision there, tell us the vision and about what’s going on in the neurosciences at the University of Maryland. BJ: Thank you for that, but first of all I really do want to give credit and compliment to a lot of my colleagues. One of the things that makes me lucky is that I’m surrounded by extremely brilliant people who are part of the brain sciences research and contortion unit. This brings together a lot of the department and it’s actually was part of the brain child of Dean Albert Reids, brilliant man, and we’re surrounded by brilliant people, so the work we’re doing is a collection of work from a team. One of the over arching things to go with and go into your artificial intelligence piece, I know you may want to do this for another time but it’s really important. What we’re trying to do is understand, lets say you’re a doctor and you go and train and want to treat X disease of the brain. You can open up a textbook and it says you diagnose X and you do Y and Z and you do that for everybody with that disease. We also have a tremendous amount of information about what actually happens to individual people. Now we never apply that to modify the treatment we’re giving to the individual. So one of the things we’re doing is an artificial intelligence project which we try and assimilate information as well as specific information and treatments about disease as well as outcomes of similar people to modify the treatment. If you like, if you watched hitchhikers guide to the galaxy, we would have our own Marvin robot, and I hope he won’t be depressed walking around on the unit providing individualized treatment and he might well be that one person needs a specific medication for 2 days but you need it for 3 days or 4 days. That kind of learning is only possible on an artificial intelligence platform. A human couldn’t do it because there is far too much information to put at any one time. That always us to develop even more powerful treatments. There are very important things in neuroscience I would like to know, for example going back to my analogy of someone getting punched in the head swelling, you know neuroscience really doesn’t understand why some people swelling in the brain comes down really quickly while for some people it’s very slow but we know it’s really linked to outcome. So one of the things we’re looking to do with our neuroscience initiative in artificial intelligence is to look at all types of brain injury as if there was brain inflammation. Now I say that in a very interesting way because most people when you say brain inflammation they think about the brain being inflamed or the brain being diseased and that is just a terrible and a bad thing. The interesting thing is certain types of neruo inflammation seem to be actually good and protective for the brain and there fore it’s very important for us to understand how the brain repairs itself, fixes itself, and understands itself. If we can aid that in terms of insoleco models or artificial intelligence we are going to develop some very powerful neuroscience tools for the future. HR: Well I wish we had more time, I know you have a hard out here shortly and I just wanted you to tell all of our audience whether they’re reading this or watching it or taking in the captions or listening to it as a podcast, how do they get ahold of you and learn more about Dr. Bankole Johnson at the University of Maryland everything you have going on there. BJ: Well one of the things that person can do is either call or email interesting don’t ask about my email address because I probably don’t remember it accurately but it can be supplied, but you can go to the university of Maryland website and you can find us out and ask questions. Also there is also a lot of reading material that has emulated from the work that we’ve been doing that you can actually get access to and these are free. These are open and these are things that are available to the general public especially the works that we’ve done that are funded by the National Institute of Health. But I don’t want to go off the show with out complimenting you Harold because one of the things that you’re doing with your neurodiversity projects is absolutely stupendous, I think it’s fascinating and I think bringing information to the public to help the general public understand the brain, how diverse it is and how they may be able to address specific problems with the brain, I think it’s absolutely marvelous and kudos to you and your team for doing this. HR: Thank you so much for the kind words and I apologize that we weren’t able to get to so many things today, we’re going to save our questions for the next session we get together and thank you so much for being with us. Dr. Bankole Johnson from the University of Maryland. Thank you so much. BJ: Thank you to you and thank you for your show and thank you to your audience that has been listening and also your viewers. 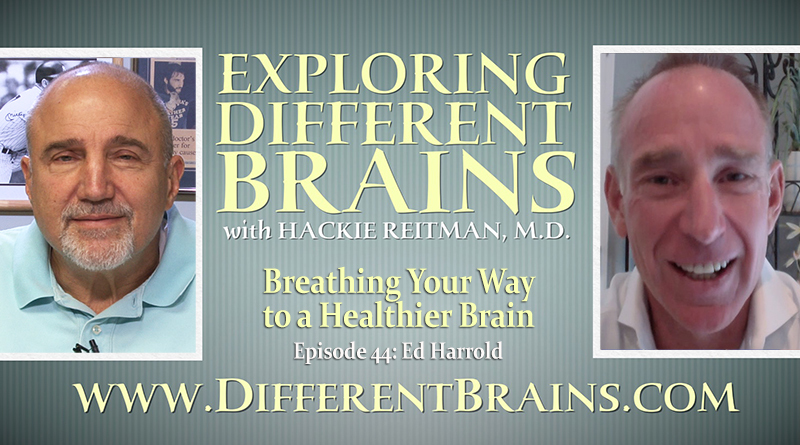 In this episode, Dr. Hackie Reitman sits down with Ed Harrold, performance enhancement coach and motivational speaker, and discusses the positive effect proper breathing can have on the brain.